Syllabus of the Online Course (Subject): Asia-Middle East Dialogue (AMED). ASEAN-Arab League. The Asia-Middle East Dialogue is a forum created by the governments to promote multi-dimensional people-to-people dialogue between Asia and the Middle East countries. 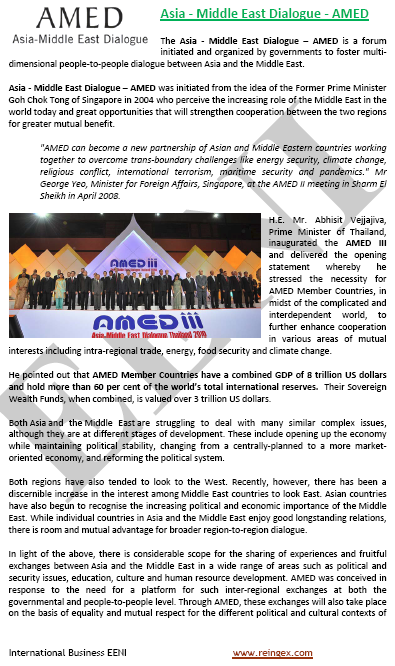 The member economies of the Asia-Middle East Dialogue (AMED) have a combined gross domestic product of 8 trillion dollars and holds near 60% of total international reserves in the World. Countries of the Asia-Middle East Dialogue has a competitive advantage to generate a sustainable economic growth and development. AMED III was attended by Thirty-nine members of the Asia-Middle East Dialogue, seventeen of which were represented at a ministerial and deputy departmental level, and the rest of which were represented at a sub-ministerial level. The members of the Asia-Middle East Dialogue (AMED) are Afghanistan, Algeria, Bahrain, Bangladesh, Bhutan, Brunei Darussalam, Cambodia, People's Republic of China, Comoros, Djibouti, The Arab Republic of Egypt, India, Indonesia, Iran, Iraq, Japan, Jordan, Kazakhstan, Kuwait, Kyrgyzstan, Laos, Lebanon, Libya, Malaysia, Maldives, Mauritania, Morocco, Myanmar, Nepal, Oman, Pakistan, The Palestinian National Authority, the Philippines, Qatar, Republic of Korea, Saudi Arabia, Singapore, Somalia, Sri Lanka, Sudan, Syria, Tajikistan, Thailand, Tunisia, Turkey, Turkmenistan, The United Arab Emirates, Uzbekistan, Vietnam and Yemen.